Lot 708. Severus Alexander. A.D. 222-235. AR denarius (19 mm, 3.48 g, 6 h). Uncertain eastern mint, perhaps Antioch, A.D. 223. 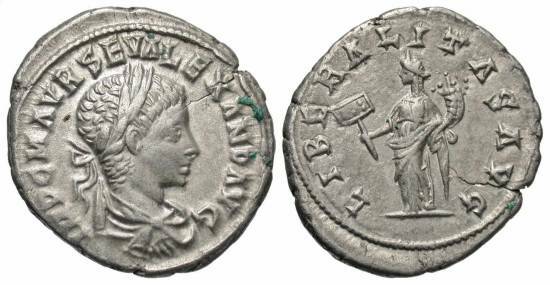 IMP C M AVR SEV ALEXAND AVG, laureate, draped and cuirassed bust of Severus Alexander right / LIBERALITAS AVG, Liberalitas standing left, holding abacus and cornucopia. RIC 281; BMC 1043-7; RSC 108b. A couple of tiny deposits, short hairline flan crack. Good very fine.